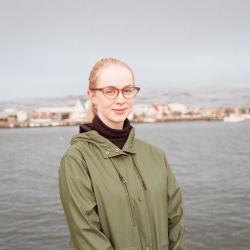 Anyone who’s danced to Egill Spegill’s set at Prikið knows he is one of Reykjavík’s favourite DJs. Despite his young age, he’s been a regular on the city’s party scene since high school and knows all the tricks for keeping the crowd jumping until late in the night. Make sure to find him working his magic at Prikið this month. I started DJing in 2012 when I was in secondary school. My first gig was at a school fashion show. After that, I started playing at all kinds of school events and in the start of summer 2013, I did my first gig downtown, DJing at Faktorý. Then in 2014, I started DJing regularly in various venues and bars downtown and I’ve been doing so every weekend since. I try to play new and fresh hip-hop, mostly trap and RnB. Prikið, Prikið, Prikið. Nothing compares to Prikið. I started DJing there in 2014 and I’ve had a monthly gig there, playing with Young Nazareth* for the last year. Those nights are my favourite. I use a Macbook air computer and a Traktor S2 controller using the Traktor program. It never fails. I also use other equipment from Traktor to switch things up, including Traktor Z2 and Traktor X1. Delay, I’m not very punctual. People that are willing to dance are my favourite. “Enginn Mórall” by Aron Can, “Roro” by Gísli Pálmi,“Karafrétta” by Herra Hnetusmjör, “For Free” by DJ Khaled featuring Drake and ‘’Uber Everywhere’’ by MadeinTYO featuring Travi$ Scott.